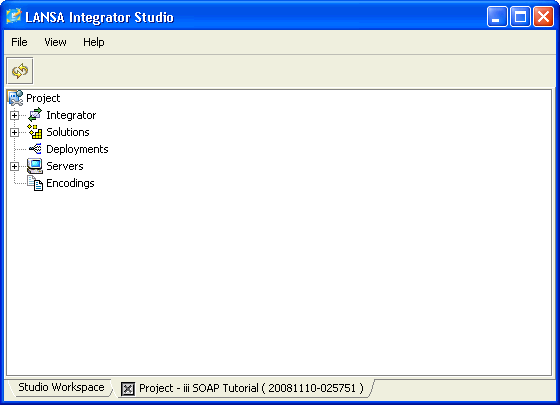 In this step you will use the LANSA Integrator Studio to create a new Project to contain your SOAP Server Solution. A Project is simply a way to organize your work. A Project contains a collection of files related to a particular application or task using LANSA Integrator. A Project will contain one or more Solutions. 1. 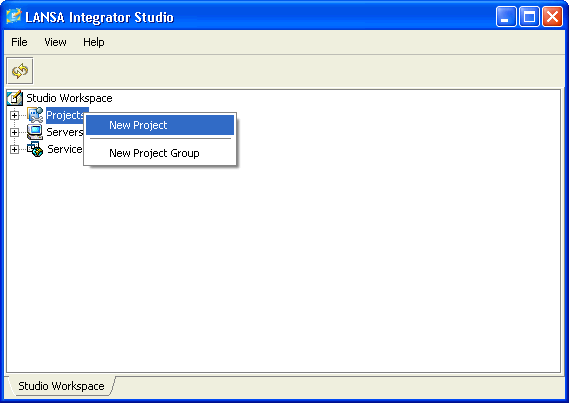 Start LANSA Integrator Studio from the desktop icon. a. Display the Studio Workspace tab. b. Select and right click on Projects to open the context menu. c. Select New Project to open the LANSA Integrator Studio dialog box. 3. Enter the name of your new project, in this case iii SOAP Tutorial where iii are your unique three letters, in the LANSA Integrator Studio dialog box and press OK.
A new tab will appear at the bottom of the studio workspace for the project. Notice that Integrator Studio has assigned a unique identifier to the project based on the date and time you created the project. This identifier is important later when it comes to retrieving, modifying and deploying the properties for the solutions contained in the project.